James Cameron—known for writing, directing, exploring—enrolled in a 2 year community college but dropped out before graduating. How did he push through to create over 6 billion worldwide of box office receipts? Terminator? Aliens? Titantic? Avatar? How did he chronicle a record breaking solo-dive to the bottom of the Mariana Trench, the lowest point on earth and film a documentary about it? The deep sea exploration came to pass with the help of a “small, dedicated, multi-tasking crew” . But as they faced deadlines and challenges tension built, like it would anywhere. In an interview with Josh Rottenburg of Fast Company Magazine, Cameron explains how the tensions were resolved and breakthroughs were made. His approach is struck a chord with me. His approach could change ministries, teams, projects everywhere if we could commit to the temporary pain of remaining in conflict and working through to a solution. But it requires commitment. Not the superficial, humor each other at the table, talk about each other away from it, kind we may experience. I think every church, every youth ministry, every missions group, every team working on something of gravity should perk up and pay attention to his method. If we could do this—like REALLY commit to doing this—we’d be able to accomplish so many more seemingly impossible things together. When describing the effort it took to film his solo dive he explains how his team worked. I’ve had the privilege of working with some incredible teams. I didn’t realize why at the time, but I thrive in these environments where we were working through to solutions. One of the biggest factors to this mutual thriving was caring. James didn’t explicitly say that his team cared. But he did imply it when he said that they showed up every morning at 8:15. Not 8:14 or 8:16. It showed that they were all-in. I’ll be the first to admit that I’m not always on time. I have distractions. I may show up with my head somewhere else. But when there is something on the line and we all need to be all-in and the leadership has communicated that, it changes my approach and it changes how I feel about what we are working on. The other sometimes uncomfortable thing about this approach–is that conversations need to be had at the table. I can think of nothing more devastating to a project than a team whose offline conversations have more of an impact on the decisions that the ones that happen at the table. It deflates the team. It disempowers the process. It disrespects the people that have been put together to work toward a solution. Some of the most beautiful environments, movements, events, ideas, solutions that I have been a part of have been created around these types of spaces that were collaborative, honest, working, and more defined. We don’t have to be James Cameron to have this type of impact on a team. It takes men and women who aren’t afraid of the results of true team development. It takes men and women who aren’t afraid of each other. It takes men and women who value each other’s contributions deeply. It takes honesty. Respect. And I’m sure more than anything, a colossal sense of humor. Let’s have great meetings where we get things done that change peoples lives and stories. Set a start time and make it a priority. Set a meeting agenda, “what do we need to accomplish here to reach our goal”, “what challenge needs our creativity”, “what do we need to do to make what we’re working on a success”. Set up your team to win. Try this for 2 weeks in a row. Meet every day for 30 minutes. Do whatever it takes to push through ininal doubts in the process. Remind them that hiding problems doesn’t help anything, bring them to the group and work them out together. When we play and work in radical transparency, we win a lot more. I want to be a leader like this. I want to create like this. I want to serve in ways that honor the process and the people involved in the process. I know of another JC who led with TOTAL RADICAL TRANSPARENCY. I have no problem abandoning every inheritance of this world, to follow this man’s example. How is your team working? 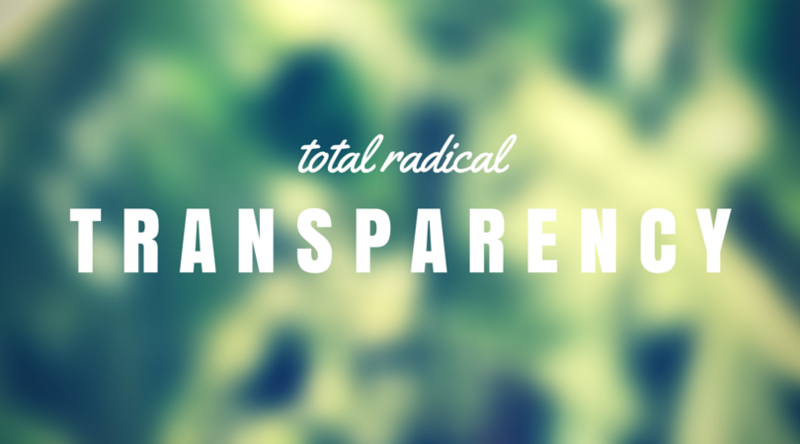 Could you use a does of TOTAL RADICAL TRANSPARENCY? Thanks Brooklyn – needed this today! I always learn from you. Your excitement, creativity, joy, and yes, transparency are gifts that we participate in from afar. Thanks Teresa–you’re words are always so encouraging. Cheering for you in Illinois and beyond. Great post Brooklyn. At Health Gives Hope, this is what we try to do. We’ve learned a few things as we’ve attempted to live this out: 1) it doesn’t happen by accident – it must be a core value that people are willing to buy into (not everyone has to be able to do it easily from the get-go but everyone needs to see the value in it and commit to it), 2) it can mean slower and more painful decision making because transparency is difficult, 3) it requires an emphasis on the process instead of just focusing on results – transparency cannot emphasize a particular result because transparency assumes that the goal/end is (relatively) unknown until everyone at the table is honest, open, and engaged, 4) sometimes it means committing to what might feel to some like a suboptimal decision (to some). Some of the benefits of radical transparency: 1) more buy-in from people, 2) people become better listeners and question-askers (which not only helps the group/organization but makes us better humans), 3) you realize as a group/organization that there are a cluster of really good ideas and distinguishing between them is often impossible (though some are convinced that theirs is the best) without taking a risk and moving forward with one idea. I really liked reading your points Jerry. The key—as you mentioned–is risk. I hope that we would all be that brave. The process is exposing and creates vulnerability but it’s worth it!